We have been working on an eco-friendly drogued drifter. 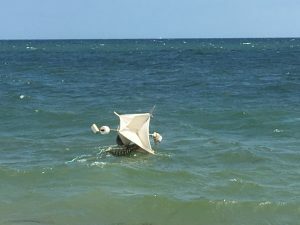 It is a star-shaped drogue (made like some of the commercial surface drifters sold on the west coast) but now has a 1”-bamboo frame and cotton sails hung below on a long tether (typically 10m). It can have a natural mushroom flotation, bag-of-rocks ballast, and various components to take up the wave shock (subsurface wooden floats and/or sections of bungee tether). There is an extensive googledoc on this development which we can share with anyone interested. While we have only deployed one thus far in the real ocean and it only survived five days before running aground, we have built four more and plan to deploy them later this year. 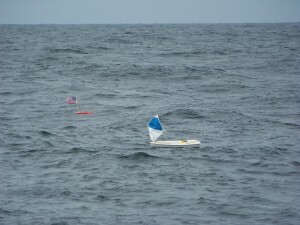 It can be rigged as a surface drifter as seen in the picture going into Nantucket Sound. Another new development is in sensor packaging. We have rigged a solar powered RaspberryPI-Zero with multiple temperature sensors and have it reporting to the Iridium satellite system. The new AP3 transmitter is now two-way system so we can now remotely change the sampling interval on the drifter or ask it “where are you now?” at anytime. Being busy with more deployments this year than any other year, we have not had much time for proposal writing. A few of our colleagues have submitted drifter proposals to NSF and other agencies but nothing is certain. One avenue we have finally began to pursue is foundations and/or corporations rather than gov’t agencies. Cassie Stymiest has recently joined us in a part time effort to find some funding in 2017. One strategy we often use is to take advantage of NSF “outreach” requirement. Any physical oceanographic proposals that involve an observational component can easily fill this the 10% requirement to do outreach by having their local schools build drifters and then deploy them. We still hope to improve our “lesson plan” options on the studentdrifters.org pages. Please send any ideas on how to improve that. (Note: The construction manuals there also need to be updated with all the new developments as noted above.) Part of our effort in 2016 was to hold a series of “drifter data workshops” in different areas of New England. Each session has (and will) include participation by teachers from several schools and each was invited to a googledoc on “what-to-do-with-drifter-data”. Teachers interested in joining this effort, email james.manning@noaa.gov. 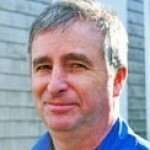 Each year we are connecting closer with EP based in Belfast Maine. While their 5’ unmanned sailboats are certainly not “drifters” they provides schools with a) another option to learn about the ocean, the wind, and, because these units move about twice the speed of a drifter and arrive in distant lands, b) exposure to other countries. We have been fortunate to work with them in developing a sensor package to install on board. With plenty of room on deck, we could install a solar panel that could not otherwise include on a drifter buoy. This development is also share in a googledoc. While keeping with the standard size and shape, we continue to modify the surface drifter materials to minimize the cost, effort, and plastic. As reported in the last newsletter, the new bamboo-framed “Cassie” is the most eco-friendly of all the surface drifters to date. We have now deployed a few dozen of these and find they do fairly well. A few have failed within a few weeks probably having to due with weak mast extensions or unsecured fittings but, in general, they are nearly as robust as other wooden or plastic models. The most exciting new development, however, is the aluminum-framed “Irina” drifter as pictured below. What makes this new rig so attractive is that it is easier to build, made from materials more easily found at local hardware stores, and does not require much ballast. We use a 1”-diameter aluminum pipe (sections of old ski poles) as our mast extension which is simply inserted and bolted to a 1”-square aluminum pipe mast. We deployed the first prototype on the last day of August and it seemed to be do fine. We are also excited about the subsurface drogued “Colin” drifters that seem to be holding up as well. Aside from the transmitter affixed to a lobster-buoy surface float, these are also made from materials available at our local hardware store. The drogue is made with series of pop-up leaf bags (with bottoms removed) which is attached to the float with a stainless bridle and tether. 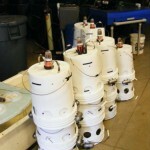 As noted in the last newsletter, we post instructions on building these new drifters at studentdrifters.org. The site includes the full history of the various experiments in design, shopping list for parts, and drop-down menus with step-by-step procedures in building the various options. The description of the new drogue construction is not yet complete. This construction manual site is separate from the main drifter site at http://www.nefsc.noaa.gov/drifter . Since the last newsletter, new schools joining the effort are the U. Connecticut, U. Michigan, Rutgers, Perdue, and the Florida Studies Institute. A total of 85 drifters have been deployed so far in 2013 and, as documented near the bottom of the main drifter page, we expect at least another 30 in the next few months. We are excited this month to have several drifters contributing to the “Gliderpalooza” operations on the east coast. All our drifter tracks are also visible on both MARACOOS and NERACOOS websites. 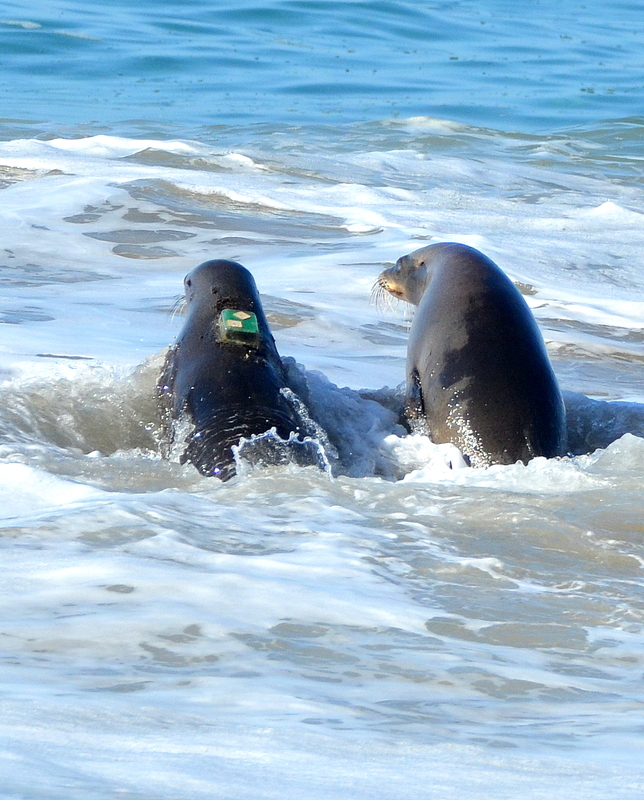 While we have further developed the submersible tracker, we have yet to attach one to an actual animal. Some have been in the hands of various biologist but none have been secured to any animals as we had hope this summer. Part of the issue is just getting permits to do so. 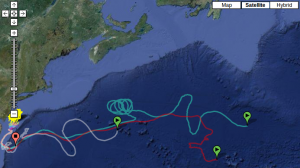 If you click on the “tracks for the last 7 days” on the main drifter site, you will see that we are now tracking the unmanned sailboats as released by various schools participating with the “Educational Passages” group. 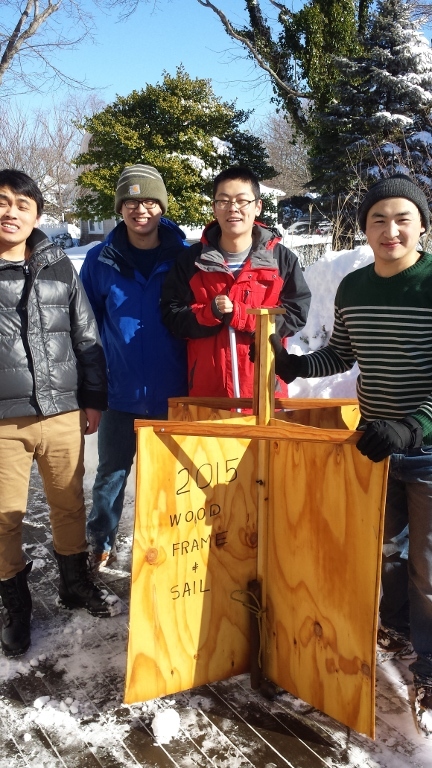 They have formed a non-profit and are enthusiastically involved in engaging more schools. A few of these boats are out in the middle of the Atlantic now and several more will be deployed this fall. We now have a reliable source of professionally-built battery packs that can be swapped for tired ones. We had tried to make our own in the past but were never sure of our workmanship. So, if you have any old transmitters that are not responding to the dongle, please send them in to be checked out. Also, please let us know if you have any transmitters in your possession that you do not plan on using soon. The service providers charge us $2.35/mth unless we “decommission” them. 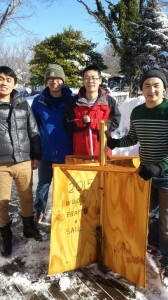 We are planning to convene several high schools in the spring of 2014 in New Hampshire or Southern Maine to build drifters. While this event will be sponsored by the Gulf of Maine Marine Educators Associations, we hope to have several other smaller events next year in Woods Hole. 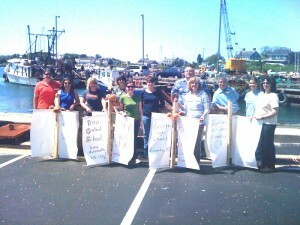 Sea Education Association students preparing for a deployment. We welcome these groups and hope they can spread the word on drifters through other local school systems. The Zephyr Foundation, in particular, has introduced hundreds of high school students to drifters this past summer. 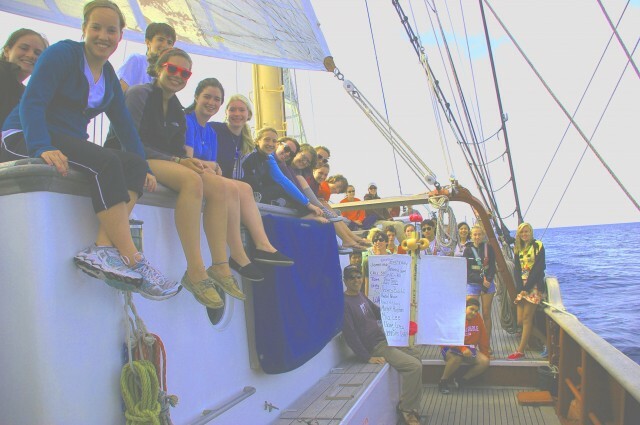 They took students on a dozen short oceanographic cruises in Woods Hole waters and deployed drifters. 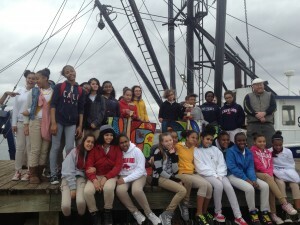 This involved a different high school on each trip with dozens of students and teachers! The “Engineering Club” at Bristol Community College in Fall River, MA have been building drifters from the kits recently. 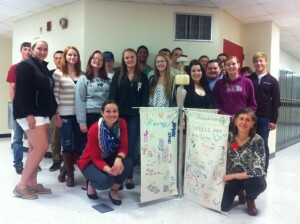 The kits are still supplied by the Southern Maine Community College. 1. Go to the “planning your deployment” link and reserve your deployment id beforehand by entering the planned position and time of deployment. The website will return this 9-digit “deployment id” that depends on what you enter. You can then mark the body of your drifter before you deploy it if you like. Some users prefer to just mark the drifter with the 6 digit electronic serial number (ESN) of the transmitter but, in either case, you will need to conduct this first step in order to have your deployment properly processed and plotted. This also gives me a heads-up on your deployment plans. 2. After you put the drifter in water, you return to the drifter website to record the actual “deployment” information. You will need to start here with your “deployment IDs” that you got from step #1. 3. Finally, after you have recovered your instrument (or notice that it has grounded), you should return to the drifter website to record the “recovery” information. You are also asked a) to submit any photos and b) whether you want to “decommission” the unit at this time. If the unit is not decommissioned, the satellite company will continue to charge $2.35/mth for these units regardless of whether they are used or not. Keep in mind, however, that they charge us another $30/unit to recommission the units. It is important that we follow through with these website forms so that the meta data associated with each deployment is properly logged (ie what type of drifter it is, whether it has a drogue, etc). We are trying to build a well-documented dataset that others can access and use in the future. The 2by4-masted “Eddie” is now our standard surface drifter. It replaces the PVC-masted “Rachel” drifter, is less expensive, takes less time to make, puts less plastic in the ocean, exposes less to the wind, and has less hardware failures. Most users will agree it is far superior. One of the primary problems with the Rachel was the flotation failures at the end of the spars (the plastic buoy sticks were breaking). We had hoped to submit a full proposal to NOAA’s Environmental Literacy Grant call for k-12 education projects in earlier this year but our pre-proposal to partner with MATE, SMCC, GoMLF, and many New England-based marine educators was declined. We will look for other opportunities to follow-up on what we have been doing for years: engaging students in drifter designing. building, and tracking. The idea would be to have a series of workshops where marine science educators from local high schools, service providers, and students learn how to build drifters. Most of the drifters are deployed in offshore waters by fishermen. If you have any leads on new proposal opportunities where this would fit, please let us know. We are happy to report that nearly 100% of the drifter operation is powered by Python. Thanks to Xiuling Wu, a student from China, we have converted all the old Matlab code to this open source language and are ready to share the code with whoever is interested. We have assembled a package of “Python for Oceanographers” and will soon be ready to distribute it to our colleagues. Two drifter-related events occurred in the past few months. A presentation was made at the National Marine Educators Conference in Boston and a workshop was held by the Marine Advanced Technology and Education (MATE) group in Monterey. Both introduced the drifter idea to more educators. We hope to promote more of these workshops in the future and look for funding that will supply schools with the basic kits. Figure 1. 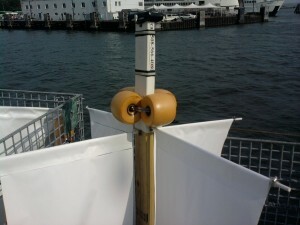 The new “Eddie” drifter with a wooden 2-by-4 mast and collar flotation. A couple dozen drifters were shipped to various labs on the gulf coast including University of South Florida in St Petersburg, Dauphin Island Sea Lab in Alabama, and NOAA’s Atlantic Oceanogrphic and Metereoology Lab in Miami. They were also sent down on both the R/V ENDEAVOR and the R/V DELAWARE to be deployed at various locations around the gulf. The tracks of these drifters can be viewed at http://www.nefsc.noaa.gov/drifter/drift_BP_Spill.html . 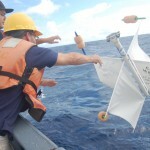 They are contributing to a multi-lab effort to understand the transport of the oil around the entire gulf as can be best seen at the USF site http://ocgweb.marine.usf.edu/~liu/drifter_all.html . We hope to submit a planning letter to NOAA’s Environmental Literacy Grant call for k-12 education projects in early September. Partnering with MATE, SMCC, GoMLF, and many New England-based marine educators, we hope to follow-up on what we have been doing for years: engaging students in drifter designing. building, and tracking. The idea would be to have marine science students at local college visit local high schools to teach educators, service providers, and students how to build drifters. The drifters will be deployed in offshore waters by fishermen. More than 200 of the SMCC/GoMLF/NOAA drifters have been deployed this year, more than any year prior. While many of them were short deployments of just a few days or weeks in estuarine/coastal waters, some have traveled offshore waters for months. The raw statistics as posted at http://www.nefsc.noaa.gov/drifter/statsd.html show many of them that have each logged thousands of kilometers. One of the most interesting tracks is that of unit # 105440672 which has been retained in the enormous tides of Bay of Fundy for nearly 3 months and is still traveling. While it has traveled a total distance of over 5000 kilometers, it is still only a few hundred kilometers from where it was originally deployed. generates animations of the drifter tracks on color-contoured imagery. The next phase of this project will overlay circulation model vectors. We are also developing a Phython application for drifter processing and visualization which will not require a MATLAB license. Drifter users are asked to be aware of which option they are under and, in the case of option #2, be ready to respond. Since we are all involved with the drifter operations on a part time basis (typically one day per week each), we do not derive our living from the sale of drifters. This is a not-for-profit organization devoted to maximizing the amount of drifters that go in the water and the students who are exposed to the science and engineering aspects of drifter use. If you correspond with Jim, Erin, or Tom via email about any drifter-related issue, please copy all three: james.manning@noaa.gov, erin@gomlf.org, and tlong@smccme.edu so that all three parties are in-the-loop. While the new drifter homepage is still under development , you can visit it at: http://gisweb.wh.whoi.edu/cgi-bin/ioos/drift/driftTable.cgi . We ask for feedback from you, the participants in this collective effort. We do NOT want to publicize this site until we have heard your feedback and suggestions. Please do not distribute this address to others or link to it from any other website. It may be months before this becomes our primary drifter website. During this transition, we will still consider: http://www.nefsc.noaa.gov/drifter/ as the main page. pay GoMLF upfront for your expected satellite fees and then get billed by GoMLF if you exceed that amount. get monthly bills directly from the satellite service provider ComTech Mobile. In this second case, if you are a new user and haven’t got billed from them yet, you need to fill out the ComTech “business agreement” form. To get one of these forms essentially filled out, email Erin (erin@gomlf.gov). Again, please copy tlong@smccme.edu and james.manning@noaa.gov on any emails concerning drifters. 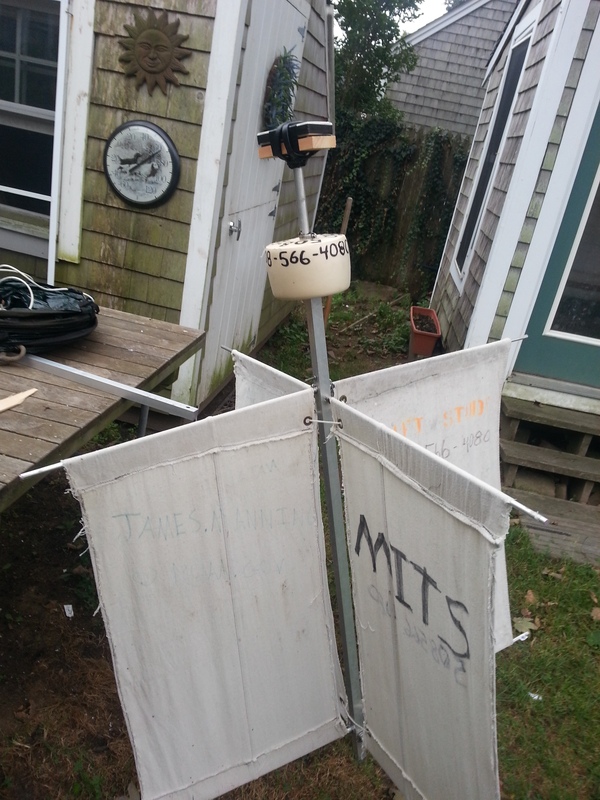 MATE participants do NOT have to worry about satellite fees since they are still covered by the NSF grant. You need to visit the drifter website both before you deploy and after. Here’s why: If you want to label your drifter deployment with the distinct “deployment ID”, you will need to know what that is. For this you visit the “Plan deployment” site. If you want us to process your deployment and make real-time plots, you need to tell us the exact time and place of the deployment. For this you visit the “Report deployment”. Let me know if you have any troubles with these sites. As with most of our sites, they are “under development”. new users should either buy at least one complete drifter (as a model to go by) or attend one of our “drifter building workshops” that we have from time to time. We recently purchased a machine to vacuum-pack the transmitters in clear plastic bags. This eliminates the need for the white vinyl bags we have used in the last few years and provides a way to insert a readable label. We still wrap the edges of the unit with black tape both before and after the vacuum packing. Users should supply us with the cell phone number that beach combers and mariners should call when they find a unit. We will seal the transmitter so that this number is visible.